Last Friday, a friend emailed: "If Cal was a country we'd be 11th in the medal count!" And, if we include Bay Area athletes in the tally the ranking would be even more staggering! Here's an article, Adrian, Vollmer Lead Cal Gold Rush, posted last Wednesday. Then, on Saturday, Nathan Adrian went on to win gold in the 4X100m medley relay with teammates, Michael Phelps, Matt Grevers and Brendan Hansen. Rewind to last Thursday as we witnessed the U.S. women's rowing team grab gold in the 1500-meter women's eight rowing competition over Canada. It was a back-to-back Olympic Gold and the 7th straight world title for the team. Led by coxswain, Mary Whipple of Sacramento, CA (whose sister, Sarah is an assistant coach at Cal) and joined by Cal graduate Erin Cafaro of Modesto and Ellie Logan (Standford grad), along with the entire team - shoved their boat first across the finish line. Read the story about Two Area Rowers Help Win Gold. And watch the inspiring post-race interview with the women's eight team by Michele Tafoya. Over the weekend, Kerri Walsh of Stanford advanced to the semifinal round of Beach Volleyball with partner Misty May-Treanor. And earlier, Rachel Bootsma and Jessica Hardy of Cal won a gold medal as part of the 400-meter medley relay team, although they did not swim in the final. So, from beach volleyball to diving, rowing, sailing, swimming and beyond, it's been an amazing Olympics for Cal and Bay Area athletes. Go Cal Bears...Go Bay Area Athletes! It's an exciting time at Splash Swim School and in the world of swimming! We are opening our new, Splash Walnut Creek facility soon, and enrollments will open shortly. Excitement is also building for the summer Olympics with the USA swimming team trials well underway. We thought we'd share some stories and upcoming events of interest. This article covers some of the local athletes as they've been preparing for the Olympic trials while renting a 5,000 square foot in the Oakland hills. It features freestyle sprinters Nathan Adrian, Will Copeland and Graeme Moore, and breaststroke sprinter Sean Mahoney. Moore has secured up a berth on the South African team while the Americans are training for the Olympic trials currently unnderway. Check out their story on SFGate. Coaching for Cal and country is a story about Teri McKeever, the first woman head coach of a U.S. Olympic swim team. McKeever has coached 17 Olympic athletes during her two decade tenure in Berkeley. Now, she has the opportunity to lead the U.S. Olympic women's swimming team to victory in the 2012 London Games! "Teri was an awesome coach to swim for," says Splash Director, Liz Claytor. "She has a gift for getting her athletes to their fullest potential, and she actively seeks ways to keep training as fresh and fun as possible. She deserves this recognition, and I am so proud to say that she was my coach!" NBC is covering the Olympic trials and games this year. Get the latest Olympic swimming photos, videos, results, track the athletes and access schedules here. 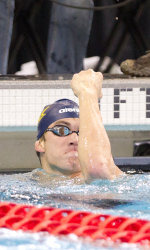 Cal Men's Swimming wins NCAA Title! Apologies to the Men's team that this article was not published sooner! Cal Women's Swimming & Diving Wins NCAA Championships! Also, we found an ESPN video of the final relay win. Enjoy! Even Otters Need Swim Lessons! We were recently sent a video of an Otter teaching her pup how to swim at the Columbus Zoo. It is interesting that otters are not born with the ability to swim, but need to learn just like us. And while the pups are not always eager for their first swim class, they succeed with encouragement and practice-- just like our students at Splash! Cal Women's Swimming Coach Named Head Coach for 2012 Olympics! In case you have not heard the news... Teri Mckeever, the head coach of Cal Women's Swimming, was named Head Coach for the U.S. women's Olympic swimming team for the 2012 Games in London. Go Bears!